Very healthy, tasty and savory rice bowl idea. This recipe was once printed on the recipe cards. 1. Bring a pot of water to a boil, then dip the tomato in hot water for a few seconds to soften the skin. Drain well and wait until it cools down. Then peel off the skin with your hands. Remove the seeds and dice. Marinate them with sesame oil and a bit of salt to taste. Keep in the fridge until you are ready to serve. 2. Beat eggs and mix mayonnaise, soy milk (or milk) and a pinch of salt in order. Put in a saucepan and cook on low, stirring constantly, until the mixture thickens according to your taste. 3. 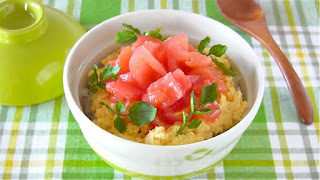 Serve cooked rice in a rice bowl, place the scrambled eggs, place the tomatoes, pour some marinade over, and garnish with watercress sprigs if available.